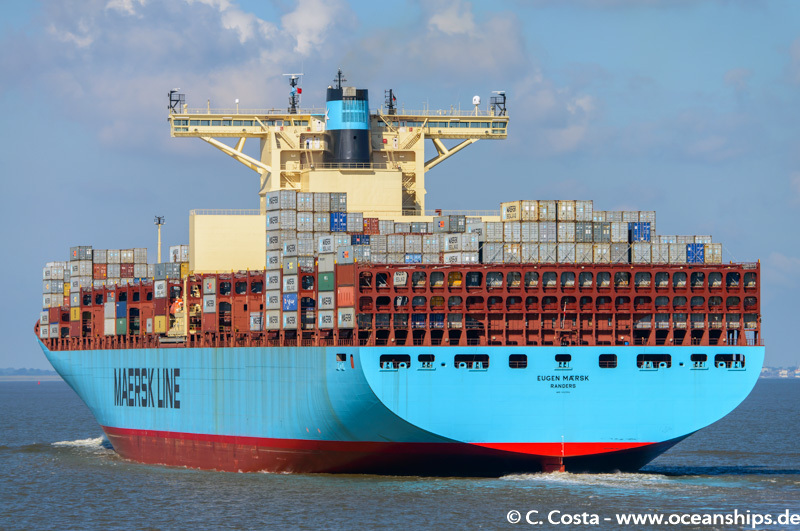 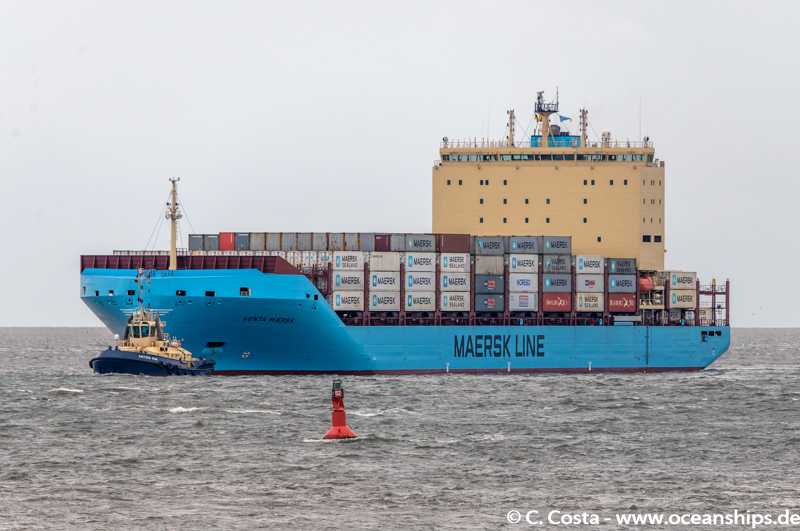 Venta Mærsk is arriving in Bremerhaven on September 22nd, 2018 on her maiden voyage in stormy weather conditions. 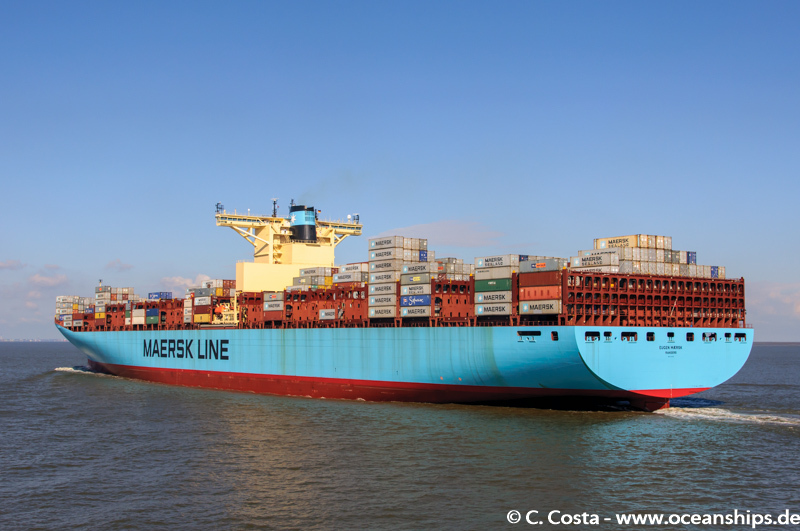 She is the very first Mærsk vessel which successfully passed the Northern Sea Route on her way from Busan to Bremerhaven. 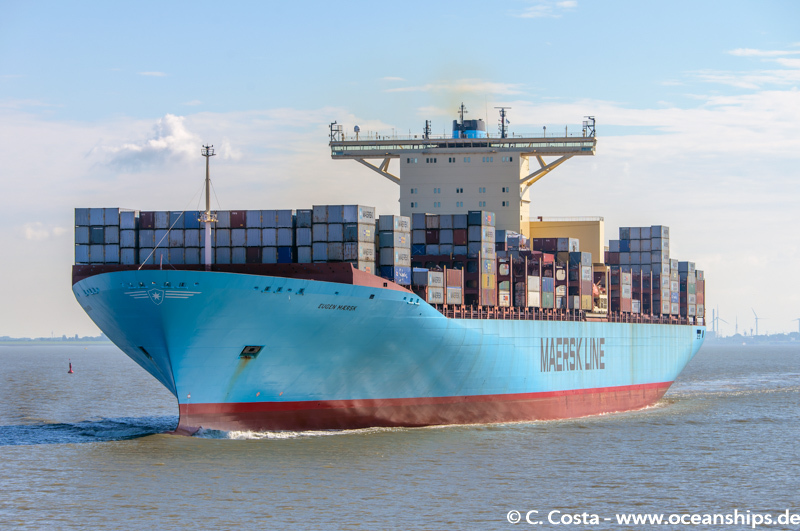 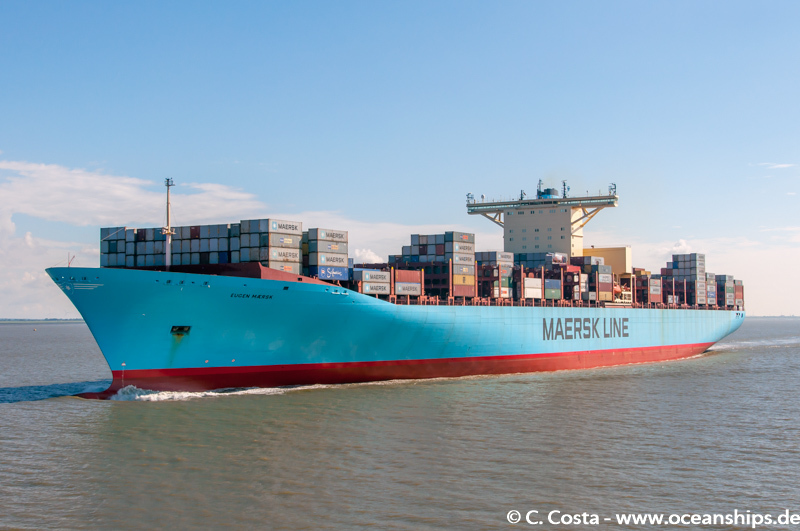 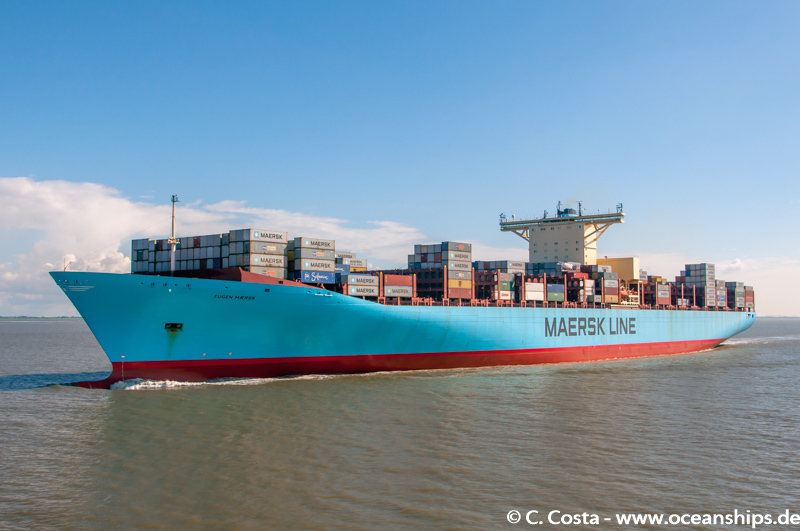 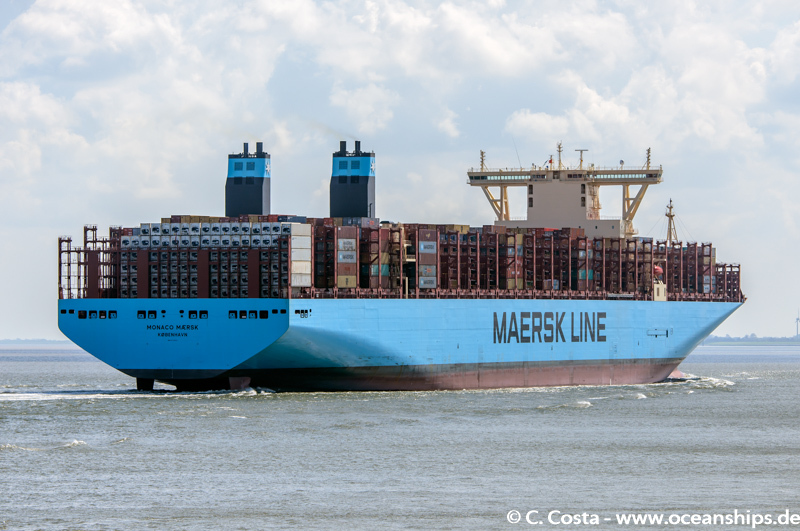 The ice strengthened container vessel is purpose built to serve as a feeder vessel for Mærsk Line’s Baltic Sea loops and will join her service in Bremerhaven. 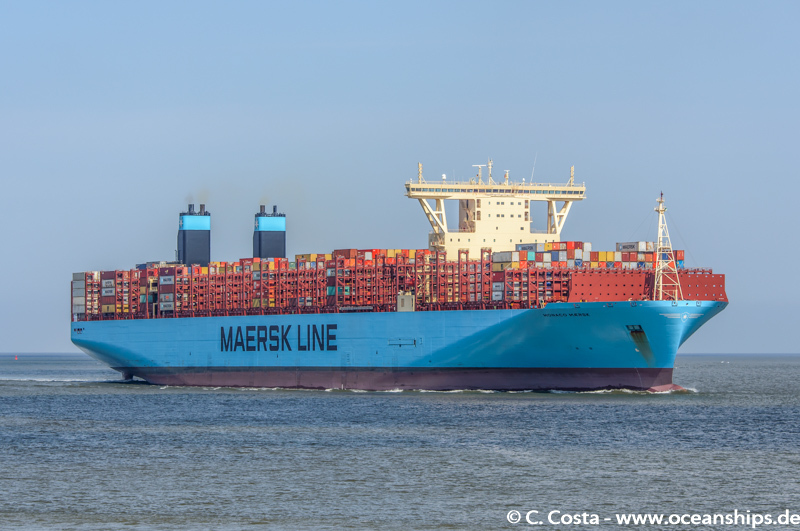 Monaco Mærsk fifth of the second EEE-class batch of eleven ships is passing Cuxhaven during her first call to Hamburg on April 27th, 2018. 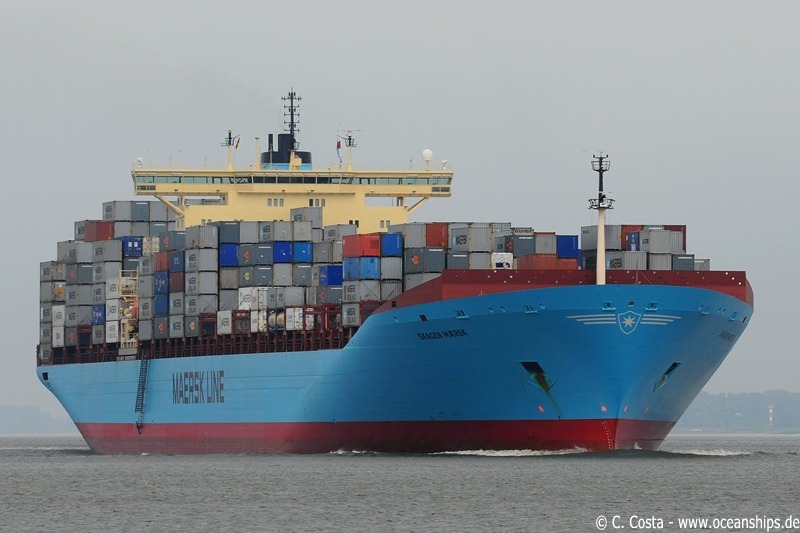 The rebuilt Eugen Mærsk on her maiden voyage after being rebuilt to carry upto 16,810 TEU. 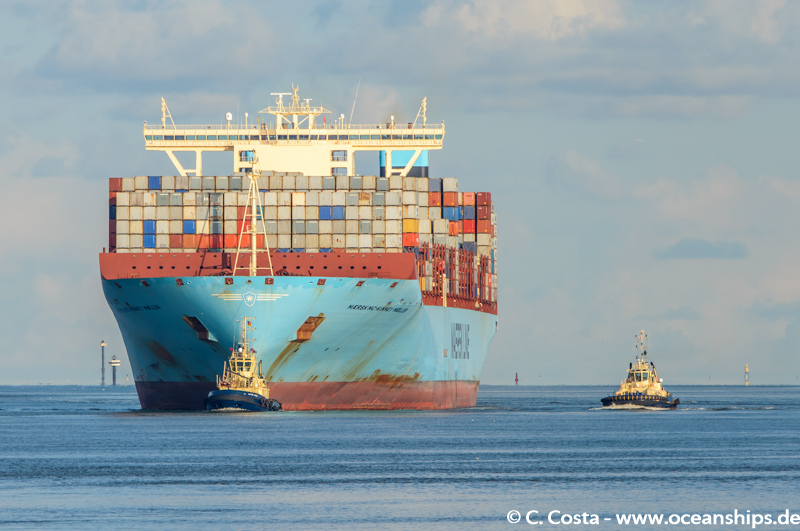 The picture is taken on the river Elbe between Brunsbüttel and Otterndorf. 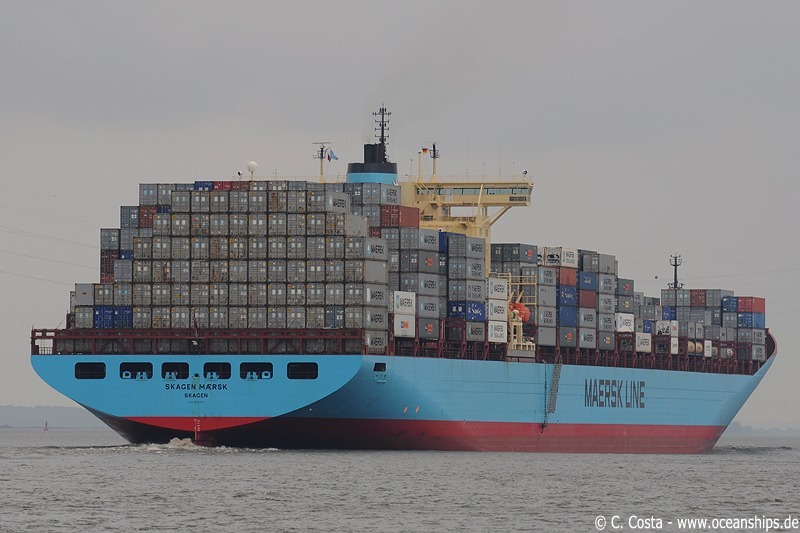 Main changes which were carried out by a Chinese yard was a slow-steaming bulb, the raising of the deckhouse by about one deck, raised lashing bridges by one tier, and antiroll tanks. 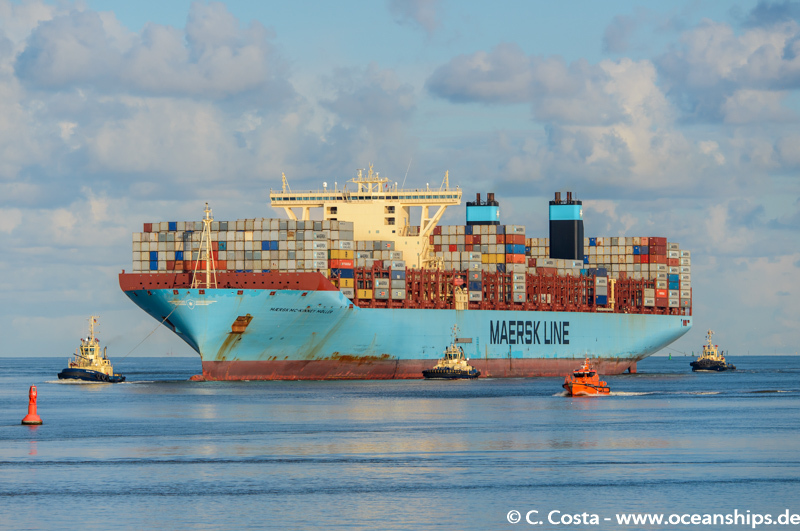 Maersk Salina is passing Altenbruch on October 7th, 2009 bound for Rotterdam. 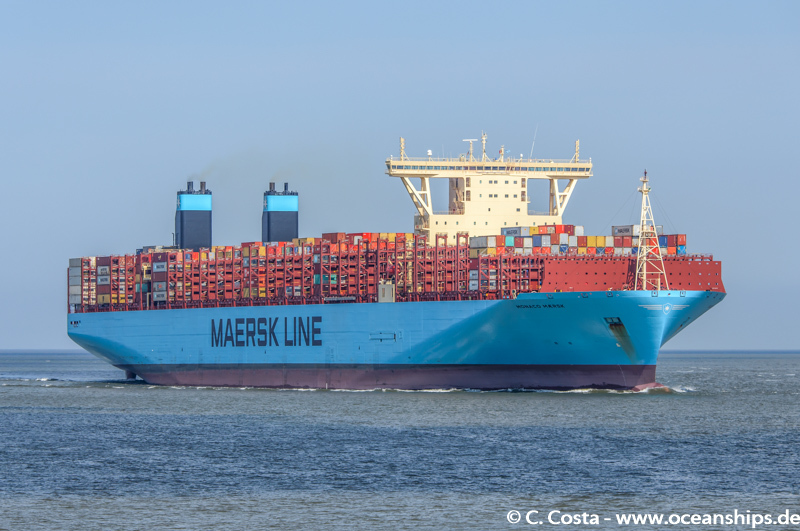 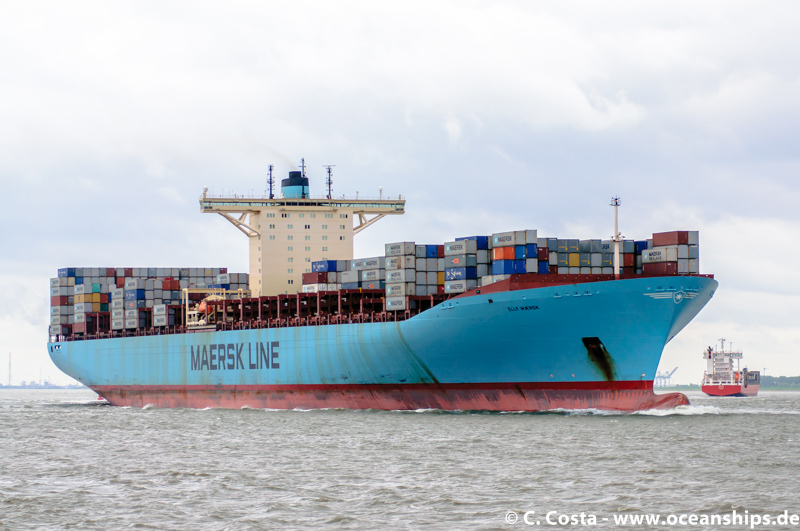 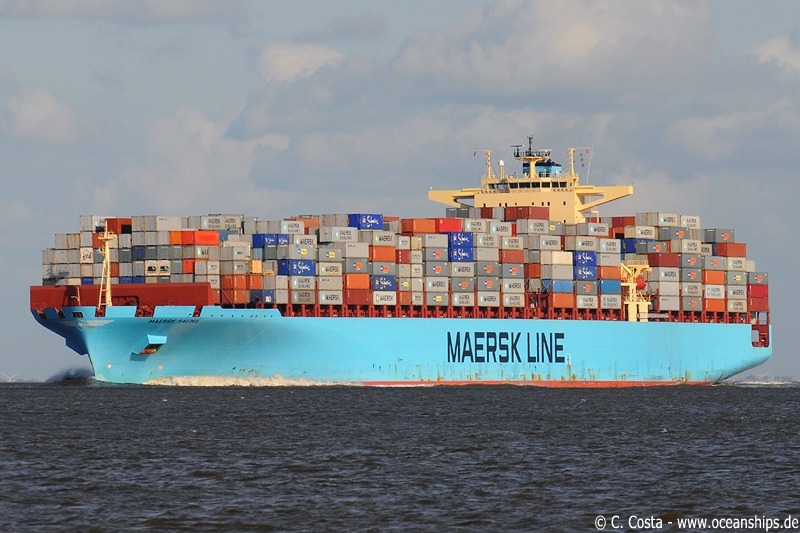 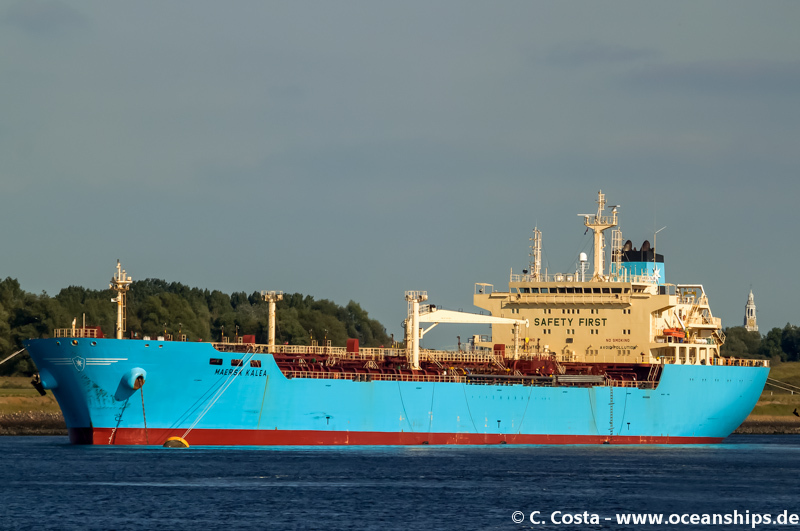 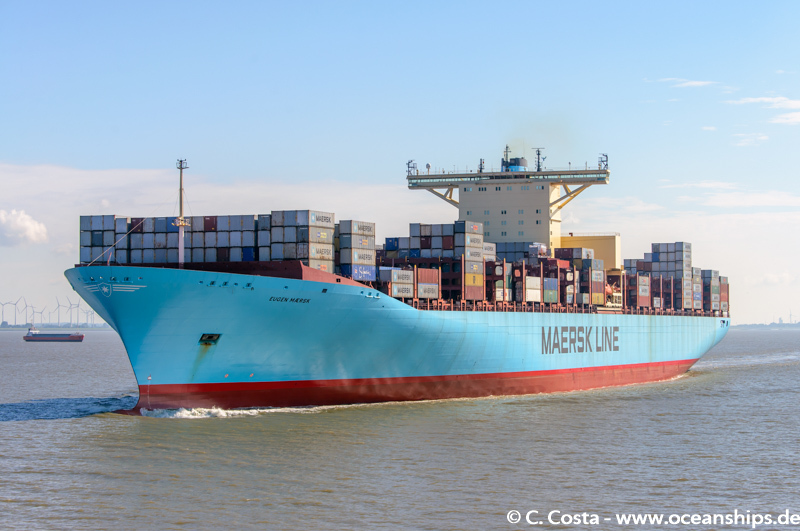 Elly Mærsk is passing Bath on May 09th, 2015. 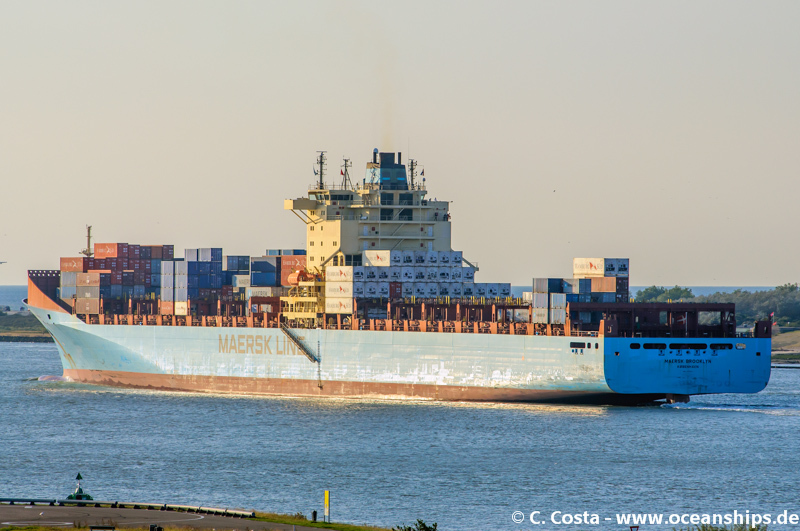 Skagen Mærsk is passing Stadersand on June 26th, 2009. 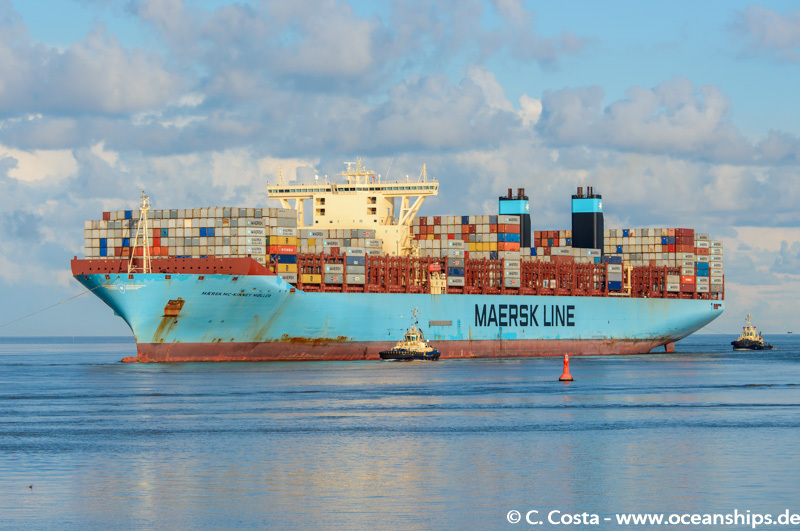 Chemical tanker Maersk Kalea is laid up at Rotterdam’s Calandkanaal waiting for a free berth on September 03rd, 2014. 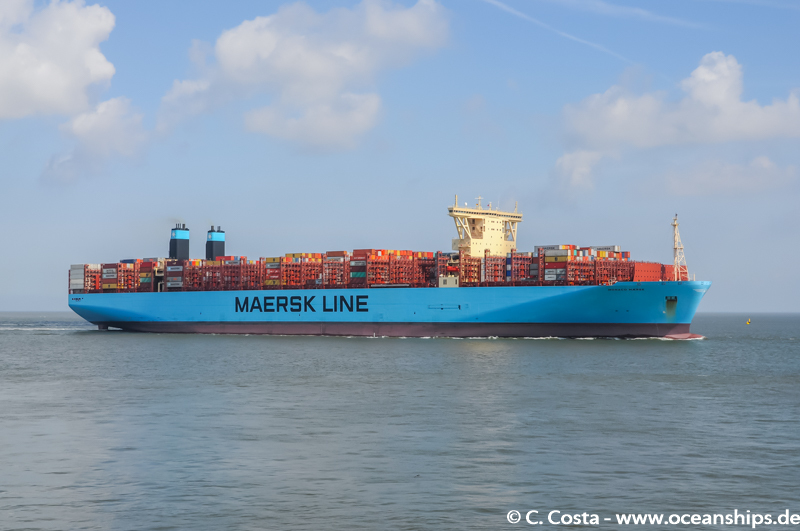 Gjertrud Mærsk is passing Cuxhaven on April 28th, 2013. 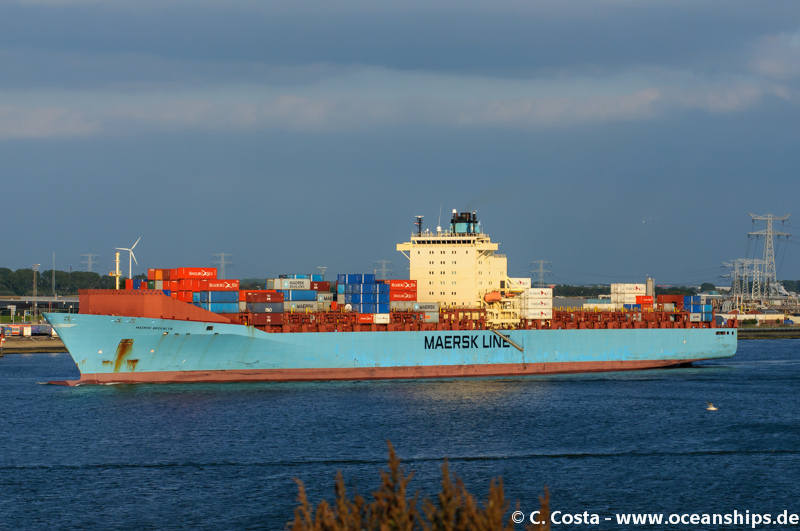 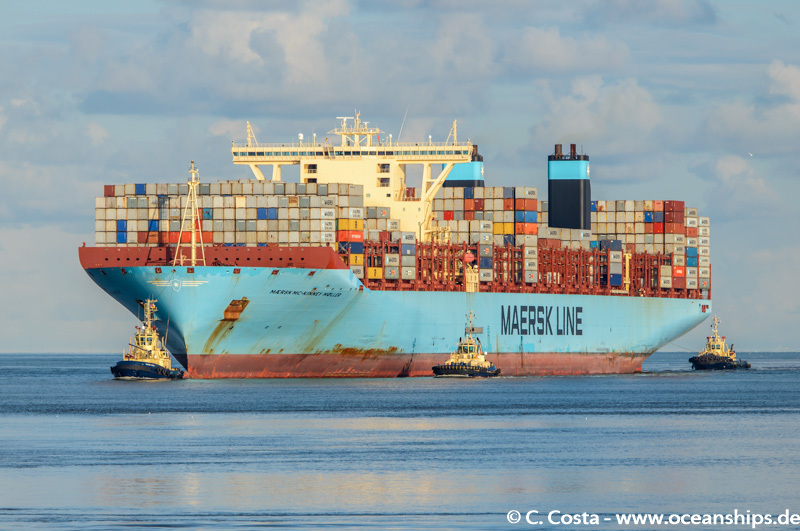 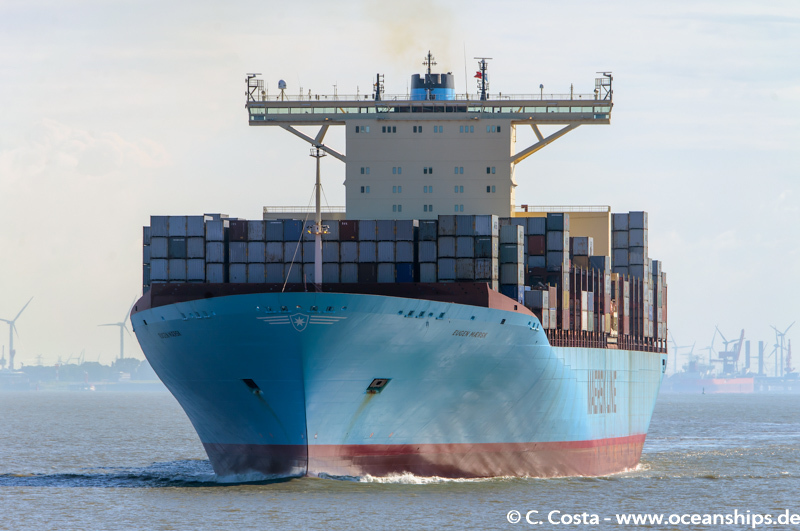 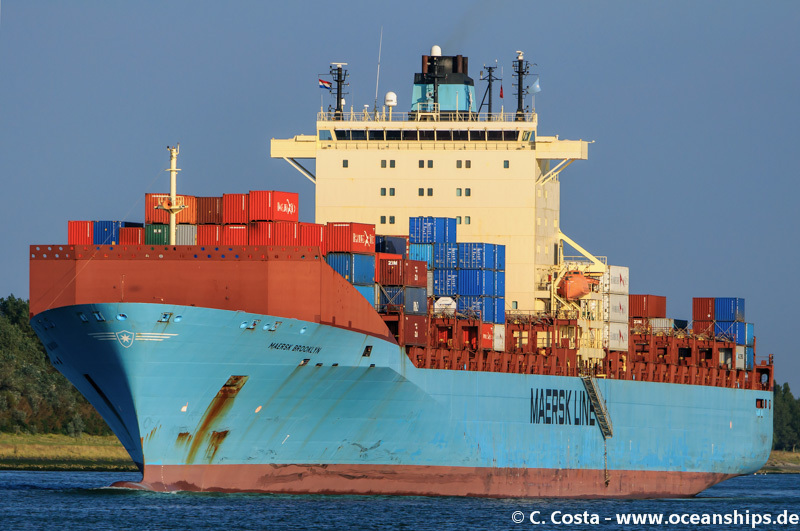 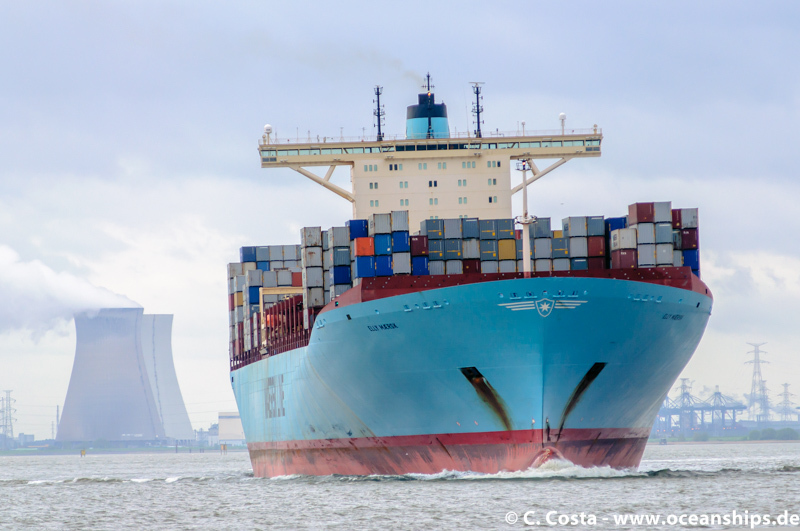 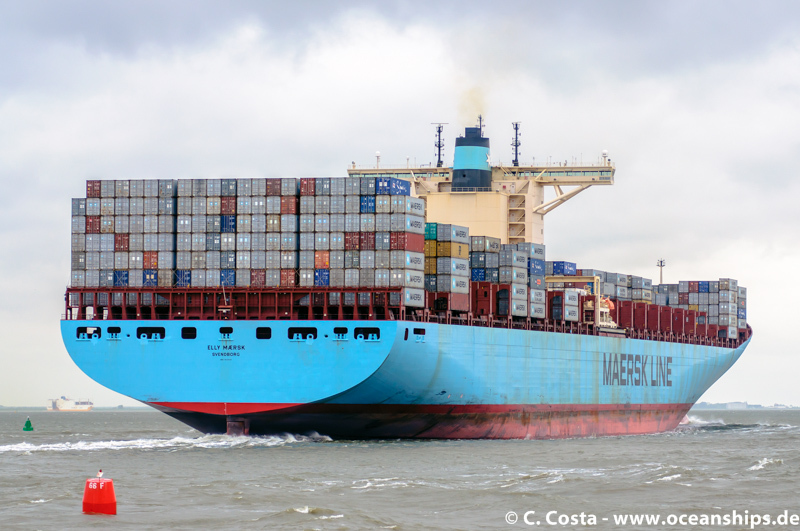 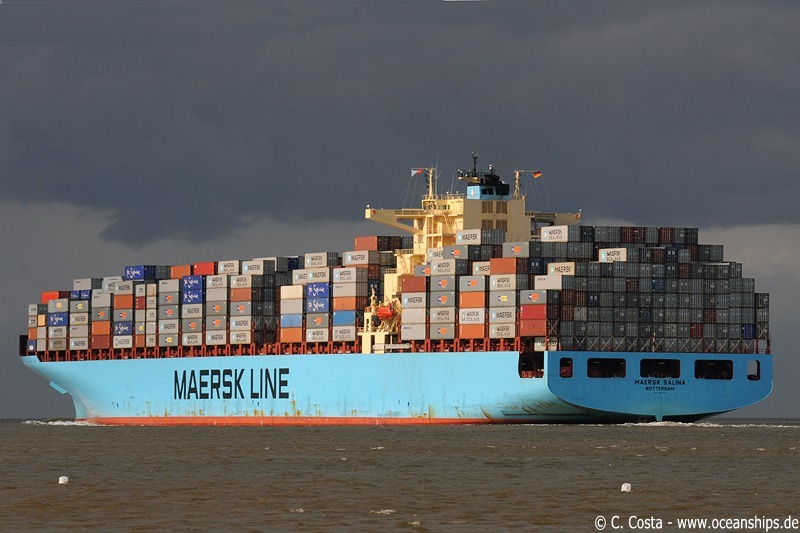 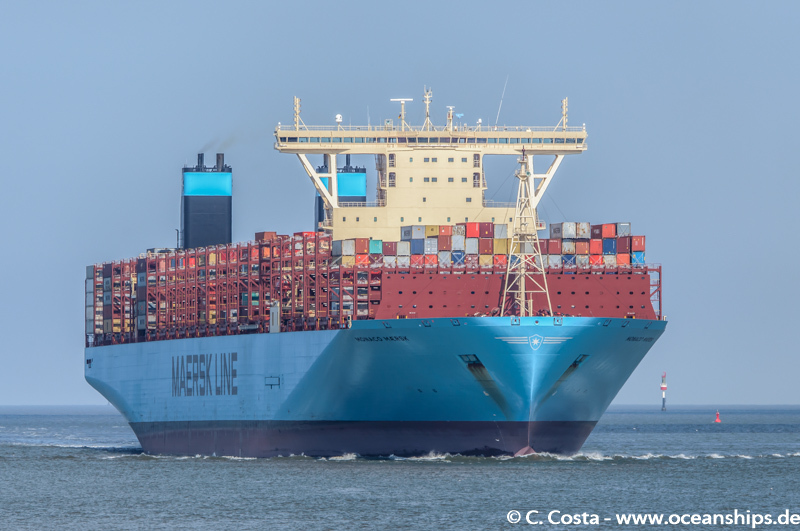 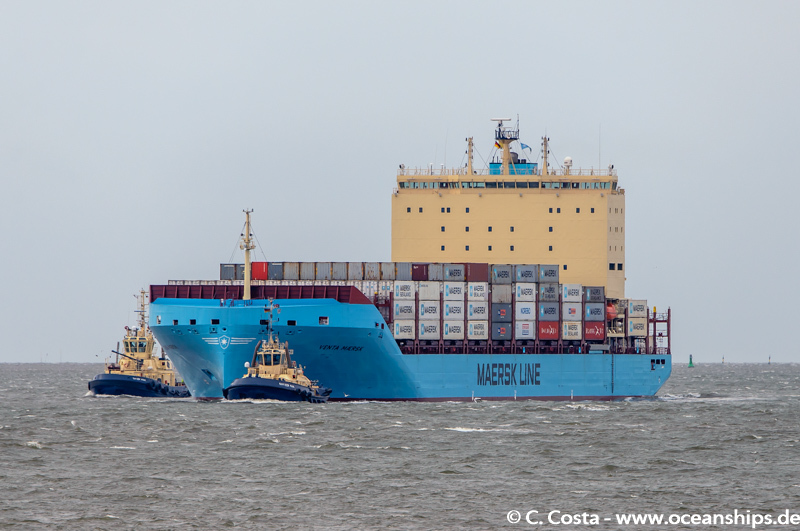 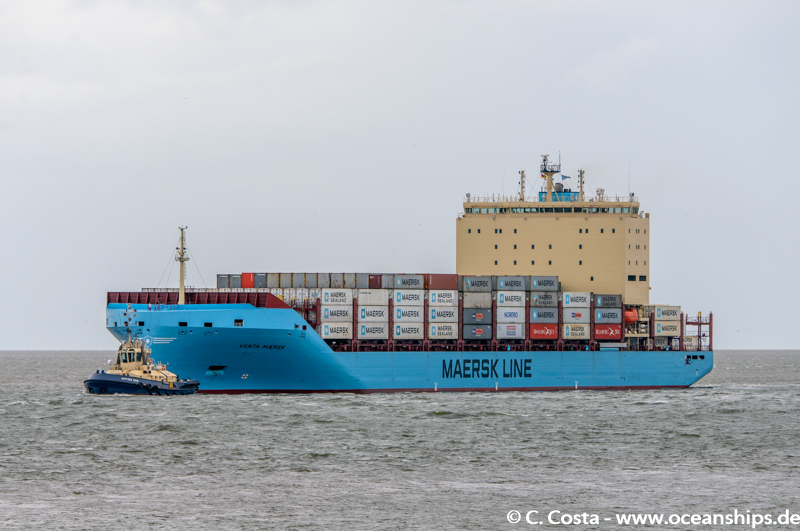 Maersk Brooklyn is passing Hoek van Holland in the evening of September 03rd, 2014.